I already did this marathon five years ago. 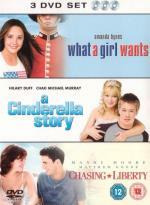 But since then I got quite a few new movies which are based on the Cinderella fairy tale. I may extend this marathon to a "Snow White"/"Sleeping Beauty" theme. 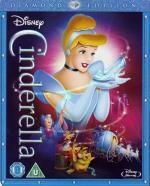 Disney's Cinderella is transformed to a new level of brilliance on Blu-ray. Rediscover the timeless story, the memorable music and unforgettable characters - now more enchanting than ever with pristine digital picture and dazzling high definition sound! Cinderella has faith her dreams will come true. With help from her loyal mice friends and a wave of her Fairy Grandmother's wand, Cinderella's rags are magically transformed into a glorious gown and off she goes to the Royal Ball. But when the clock strikes midnight, the spell is broken, leaving only a single glass slipper... the only key to the ultimate fairy-tale ending! Of the big animated Disney movies I saw, this is one of my least-favorite. Too much focus is put on the animals instead of Cinderella for my taste. This is why it took this long that this movie got into my collection. And only because it is a triple pack with the two sequels. I have seen the second one in the past and remember enjoying it. And the third one seems to be a time-travel movie, which is always a plus for me. The highlight for me on this disc is the short "Tangled Ever After". One of my favorite Disney movies is "Tangled", and that short is kind of a sequel to it. It shows the wedding. I enjoyed this direct-to-video sequel more than the original movie. Mainly because Cinderella gets more focus. There are three separate stories in this movie. I liked the first one. It deals with Cinderella's first few days in the castle after her honeymoon. The second story is again too much about the animals (especially one of the mice). The third story is okay again though. It is about Cinderella helping one of her stepsister getting a man. What if the slipper didn't fit? Experience the wonder and the majesty of Cinderella's classic fairy tale with a spectacular twist in Disney's all-new motion picture adventure 'Cinderella: A Twist In Time'. When her evil stepmother gets hold of Fairy Godmother's magic wand and turns back the hands of time, Cinderella must find Prince Charming and break through the new spell. Gus, Jaq and all your favourite characters return in an exciting and hilarious new take on one of the most celebrated films of all time. Bursting with show-stopping music and more magic, wonder and suspense than the original, 'Cinderella: A Twist In Time' is enchanting entertainment for the entire family. My favorite of the three. I quite enjoyed it. It is a what-if story. What if the shoe didn't fit but instead fit one of the stepsisters. This time the movie really had the focus on Cinderella and even the prince. Even he got a little character this time around. The film stars Libuse Safránková as the title character, a young woman who is put upon by her stepmother and stepsisters. The film employs a twist, though, when a handsome prince comes knocking. Cinderella does not simply fall into the prince's arms. In this version, he must actively pursue the young woman who is a skilled sharpshooter prone to wearing hunting outfits. Cinderella also has three wishes at her disposal, gained from three magic nuts. 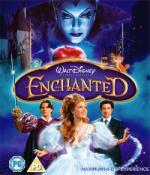 Since I last did a Cinderella marathon, I double-dipped for this movie and got it on Blu-ray. One of my favorite Cinderella movies and probably the one with the most adorable Cinderella. 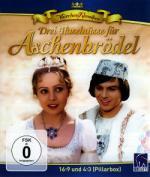 This is a charming Czech/German co-production and tells the czech version of the Cinderella story (and not the version by Charles Perrault made famous by Disney, which is mostly known in the US). In 1957, Broadway's reigning songwriters and Broadway's brightest new star joined forces to create a new musical version of CINDERELLA; it's one-night-only broadcast on CBS-TV was viewed by more than 115 million people – one of the largest audiences in television history – and an instant legend was born. So take a journey back in time to a special moment in television history, and see it as it happened – live. Many fans thought they would never get the chance but, as the Fairy Godmother says, "Impossible things are happening every day!" I have wanted to watch this movie since I first heard about it. I liked the idea of it. I enjoyed it, but I must admit that I expected more of it. Say what you may about Kristen Stewart, she is beautiful in this movie and was a good casting choice. A classic fairy tale Snow White gets a modern make over in the enchanting MIRROR MIRROR. In a kingdom far away an evil queen (Julia Roberts, Eat Pray Love) has taken control of the land and has her eyes set on the young, handsome Prince Alcott (Armie Hammer, The Social Network). Aided by witchcraft and her bumbling assistant Brighton (Nathan Lane, Mouse Hunt) she plans to steal his heart. The only thing standing in her way is her beautiful stepdaughter Snow White (Lily Collins, The Blind Side). Banished to the dark forest Snow White enists the help of seven outlaw dwarves who vow to help her take back her kingdom and break the spell cast over her beloved prince. 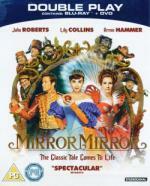 Lavish, magical and hilarious, MIRROR MIRROR is romance and adventure at its most spectacular. I heard not so good things about this movie, but I am pleasantly surprised. I enjoyed this movie. 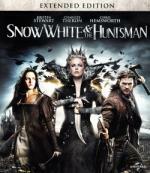 A nice retelling of the Snow White story. I am not finished with this marathon yet, but are there some additional Cinderella or Snow White inspired movies which you can recommend? I have one on the way (the one with Kristin Kreuk as Snow White) and another one on my wish list which I will buy with my next order ("Snow White: A Tale of Terror"). A remake of the live-broadcast. I enjoyed this one more. Although there is something which bothered me a little. The stepsisters of Cinderella look the same age as their mother. Also the video quality could have been better.